Present the highest quality – anywhere, anytime. Show your customer a complete smart home system as he could see it later in his own home. 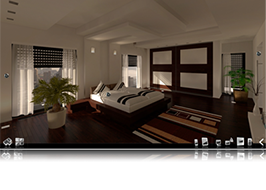 To make this possible, innea apartment stands out due to its photo-realistic rooms, which do not require any abstraction by the client. 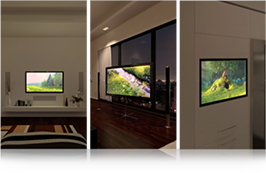 In order to fully immerse customers in the comfort of your smart home systems, we combine it with photo-realistic environments. We offer no schematic representation – we make it possible for you to present in real rooms. You can experience the innea apartment at day and night. By day, the rooms are flooded with light, so you can present the shades control very well. At night, lighting moods can develop their full potential. This allows you to convincingly simulate scenarios based on the time of the day. The innea apartment is a fully equipped smart home, which could stand model for every real project. Your customer will be surprised how simple each room can be immersed in a new atmosphere, just by invoking different light scenes. Each integrated lighting circuit can be dimmed individually and can be stored in a light scene. In addition, each room offers atmospheric RGB lights that fit seamlessly into the architecture. The integrated media system includes a variety of media sources such as audio server, video server, BluRay player, radio and TV receiver. Each source can be played in all four media zones. This opens up many possibilities, for example to start a movie in the living room and finish it in the bedroom. In total there are nine individually controllable shades available in the innea apartment. Integrated with global functions such as “Arrive” or “Leave”, your customers will not want to do without automating the shades in their future home. 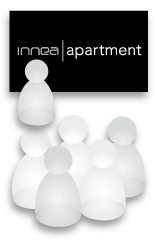 To start working with innea apartment you will not need any previous experience. 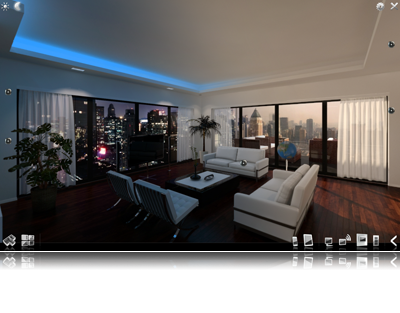 The overview mode provides a convenient view in which you can experience all rooms simultaneously. Your customer can realize for the first time, how global scenarios, such as “Arrive” or “Party”, put the entire home directly into a new atmosphere. Touch and gesture control, even more intuitive! 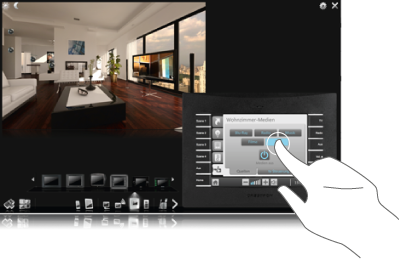 With touch-sensitive devices like the Asus Slate and Windows 7 you can control the innea apartment by touch. The entire application has been fully optimized for operation by touch, for example you can use gestures to intuitively show or hide control devices. Directly operating the integrated touch panels and keypads is an awesome feeling – as your customer would experience it in a real apartment. 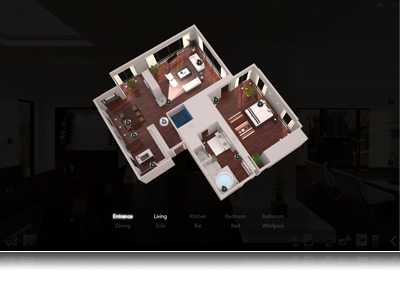 The illustrative 3D floor plan provides orientation and shows the layout of the premises at a glance. Through the floor plan you can go directly to any point of view, e.g. from the sofa in the living room to the whirlpool in the bathroom. 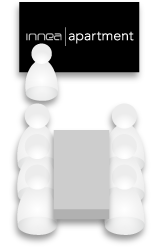 If you are within the 3D environment, you can easily navigate through icons from room to room. Showing static images in a simulation is simple. More complex it is to enable the user to look around, which is one of the reasons for the fascination and immersion of innea apartment. 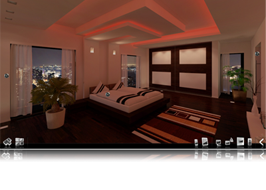 Through the intuitive 180° panorama you can view the rooms and the lighting design in their entirety. Your customer will feel as if he were actually in an apartment in New York. 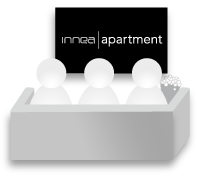 The innea apartment is especially designed for sales pitches at the customer site. Thanks to the intuitive user interface, you can effortlessly focus on the points that particularly interest your customer during the pitch. Your customer wants to give it a go and try the control devices himself? Well, no problem! Hands-on you will acquire him for your smart home solution. 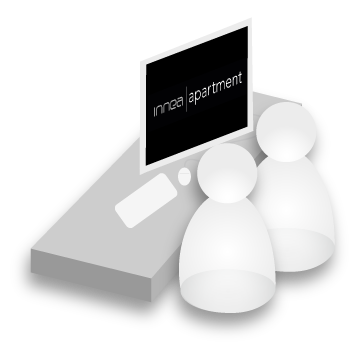 With the innea apartment on your booth you leave competitors way behind. 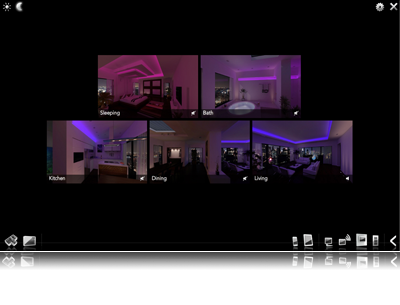 Show your visitors the full impact of home automation. Extend your showroom by more rooms, functions and control. 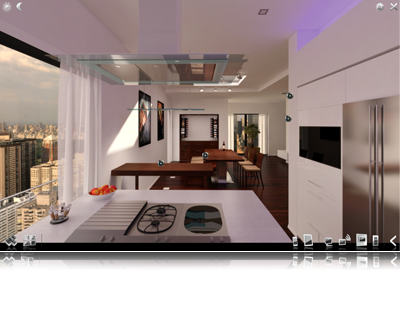 Present the innea apartment on a large touch screen at your showroom. The playful presentation of your smart home solution will spark the enthusiasm of your seminar participants from the very beginning.